Robinson Bradshaw places a high value on their office security and their clients’ privacy. The North Carolina-based corporate law firm has been providing legal services to clients across the country since 1960. And along the way, they’ve picked up some high-profile clientele. The privacy of those and other clients is what led Robinson Bradshaw to The iPad Receptionist. Bobby Hendrix, the firm’s mobile device specialist, explains, “Clients appreciate privacy when they come into the office, so we didn’t want to compromise client confidentiality with a sign-in sheet at reception. We like being able to provide clients with The iPad Receptionist’s private and convenient method of signing in.” The firm decided an automated reception system would solve that issue. After searching online, Hendrix chose The iPad Receptionist because of its positive reviews. He also appreciated the simple set-up. “We bought stands right off of the website,” he says. “Everything was in one centralized location, so that made it easy.” Now, all three of the firm’s offices use The iPad Receptionist. Hendrix says the advantages go beyond privacy. “We also have a better record of who’s coming and going,” he notes. Another advantage is that each office has been able to customize the technology to meet their specific needs. For instance, the Chapel Hill office—which has about 15 attorneys—takes advantage of the full complement of features. 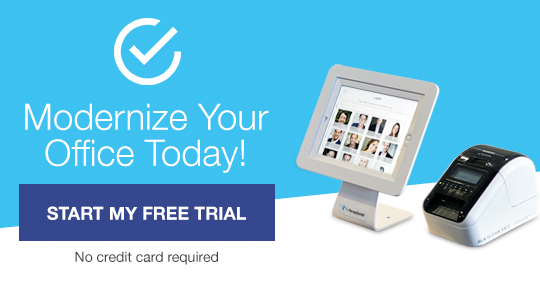 When guests sign in, the system automatically sends an email or text notification to the appropriate attorney so that they can come out and meet their visitors. But in the firm’s main office at Charlotte—where more than 100 attorneys are based—the staff prefers a hybrid approach. Guests sign in on an iPad for privacy and recording purposes, and a receptionist continues to notify attorneys by phone. And due to the size of the office, the firm has installed two iPads so that multiple people can sign in at once. The firm’s third and smallest office, in Rock Hill, SC, uses a similar approach. Hendrix says staff is happy with the results. He also gives high marks to iPad Receptionist support. “The support is outstanding,” Hendrix says. “They get right back to me, whatever question I have.” He recalls one situation in which support staff went above and beyond in responding to his requests. “We had a couple of issues where people were having fun at our expense,” he says, by signing in under fictitious names. Hendrix called support to find out about deleting records. At the time, that wasn’t a feature of the application. But The iPad Receptionist staff understood the issue, and within a week, they had updated the software to enable record deletion. We’re delighted to hear that The iPad Receptionist has helped Robinson Bradshaw protect its clients’ privacy. And we love hearing that our support is helpful and responsive to our customers’ needs. We’re always working on ways to make our product even more effective, and we always have new features in the works. Stay tuned! 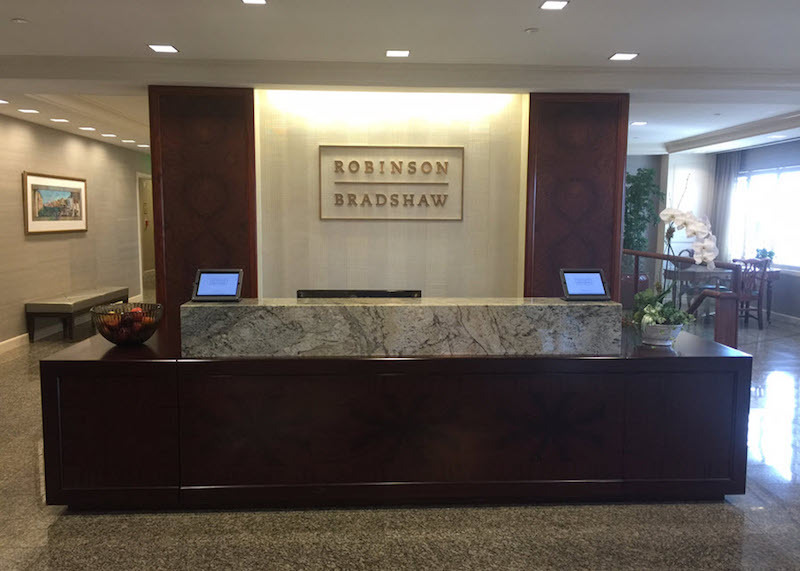 Founded in 1960, Robinson Bradshaw is a full-service corporate law firm committed to providing clients with comprehensive legal services of the highest quality. A large regional law firm with national practices, Robinson Bradshaw assembles the team that is best positioned to efficiently and effectively handle a matter – across practices, if need be – and they focus on their client’s best interest at every stage of the process. More information is available at www.robinsonbradshaw.com.